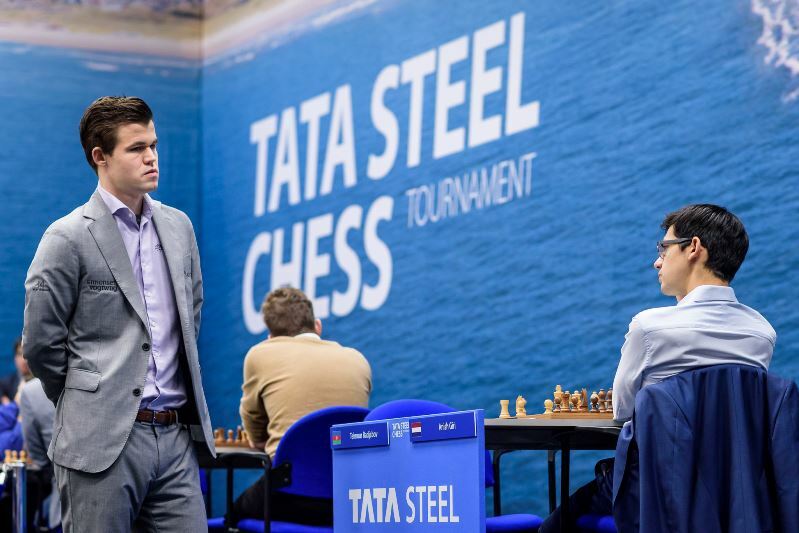 Magnus Carlsen ground out a 71-move, 6.5-hour win over Jan-Krzysztof Duda to take a half-point lead into the last round showdown with Anish Giri. It could have been a full point, but just when Giri was wondering what to say about defeat in the post-game interview Teimour Radjabov offered a draw. 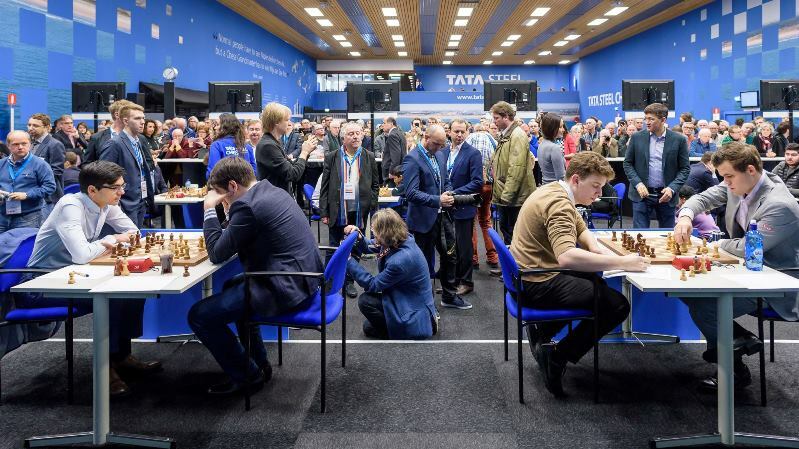 Elsewhere Sam Shankland bounced back to beat Ian Nepomniachtchi and Vladimir Kramnik picked up a second win in a row against Vladimir Fedoseev. In the Challengers Vladislav Kovalev remains the heavy favourite after beating Elisabeth Paehtz to take the lead. Go Premium to watch Jan and Peter live. Now’s a great time to try it out as the voucher code TATA2019 will give you 30% off all subscriptions! Duda sank into a 21-minute think, but then seemed to play decent moves until 16…h6?! I don’t know if it was winning, but it was certainly considerably better. I don’t know if he fell for a trap or what he did, but I think after h6… what happens is forced and then it’s very difficult for him. You don’t really expect your opponent to fall for the tricks, though, so I didn’t really know the details. Usually he converts anyway, because there’s still some pressure on the opponents and the opponents are mentally ready to lose to him most of the time, so I think he will do his thing. I’m a bit sad that last year’s playoff won’t be repeated, but apart from that I’m happy and it’s always better to be ahead. I think the funny thing is that despite getting an extra half point every day I’m probably not even going to be in the lead going into the last round! He felt he misplayed a promising middlegame position. He thought there was little left in the endgame. In his head he saw my g and f-pawn marching, but even in my wildest dreams I didn’t see any pawns marching. I myself have seen a lot of ghosts in my life to know that happens. 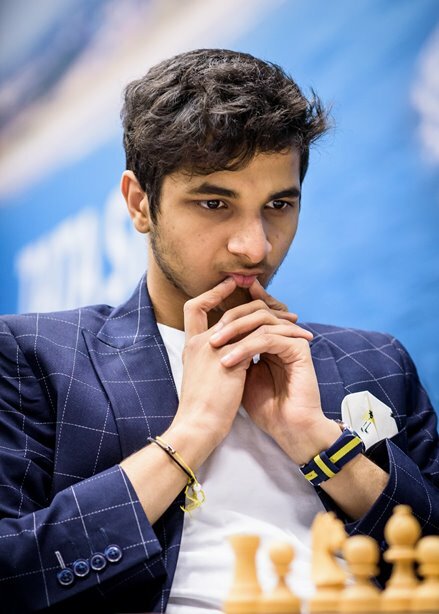 That amnesty means that Giri can become the first Dutchman to win the top event in Wijk aan Zee since Jan Timman in 1985 if he beats Magnus with the White pieces in the final round. Any other result will mean Magnus defends his title and extends his record for the most victories in Wijk to 7. Is it therefore a must-win game? Why must-win? You assume that I want to win the tournament, for some reason! I think Magnus has also a lot to prove. I’m just going to defend with the white pieces and see what happens. Obviously it feels good to come back from the worst moment of my career with one of the biggest wins of my life. But ok, I’m a big boy, I roll with the punches - that’s how it goes. Today I played quite decently, I think. I was not expecting this, but it happened! White can’t take twice on c5 without allowing a double attack on White’s minor pieces, and soon Black was completely on top. Vlad feared the computer would point out mistakes, and it does – both ways for Fedoseev to equalise and faster wins – but overall it was indeed a well-played game by the former World Champion. Every single game had something to offer. Ding Liren-Anand was a chance for one of the players to fight for tournament victory, but instead it saw a curiosity – the Chinese no. 1 opened with 1.e4. The games he’s done that against the very top Western players are incredibly rare. The last occasion seems to have been on August 9th 2017 against Anish Giri, the game he lost before going on a 100-game unbeaten streak. And before that? November 21st 2002, when he beat a certain Fabiano Caruana in the World Under 10 Championship! 28…Rd6! solved all Black’s issues, based on the little trick 29.Rxd6 Re1+ 30.Kh2 Bc7, regaining the rook. The game was drawn in 40 moves. 38.Bh7+ Kxh7 39.Qxf7+ Kh8 40.Rb8! Qxb8 and the players agreed a draw. Black can’t escape from checks as if the king tries to run to the queenside White will win the black queen on b8 with a skewer. White’s position would hold if not for 22…Nxf4!, with the point that 23.Rxf4 runs into 23…Qxe5, and suddenly the rook on f4, knight on e3 and bishop on e2 are all left exposed and undefended. Elisabeth went for 23.Ndc4 instead, but after 23…Bxe5 she was simply two pawns down and still under a fierce attack. Kovalev has White against joint last Stefan Kuipers in the last round, but in case he slips up 16-year-old Andrey Esipenko is the one other player poised just half a point behind. The young Russian has scored a brilliant unbeaten +5, with all his wins coming with the white pieces. 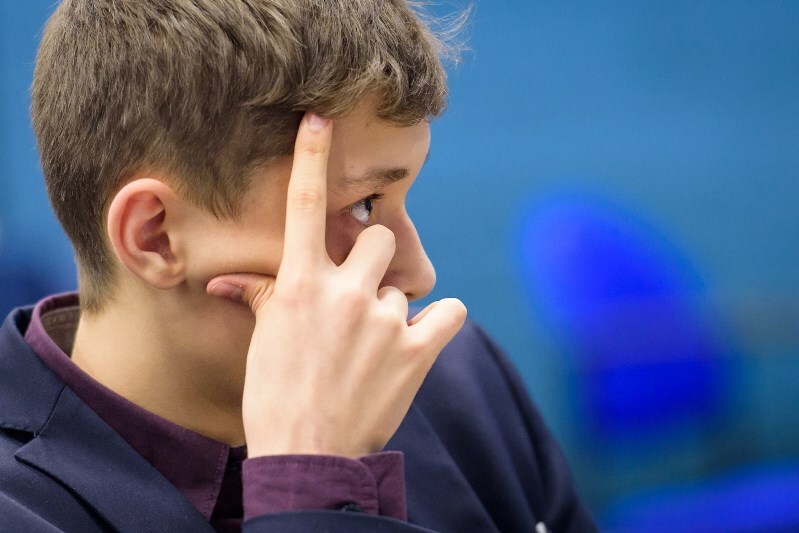 In Round 12 against Dinara Saduakassova he allowed himself a 47-minute think over an unclear piece sacrifice, but still went on win spectacularly in just 24 moves. 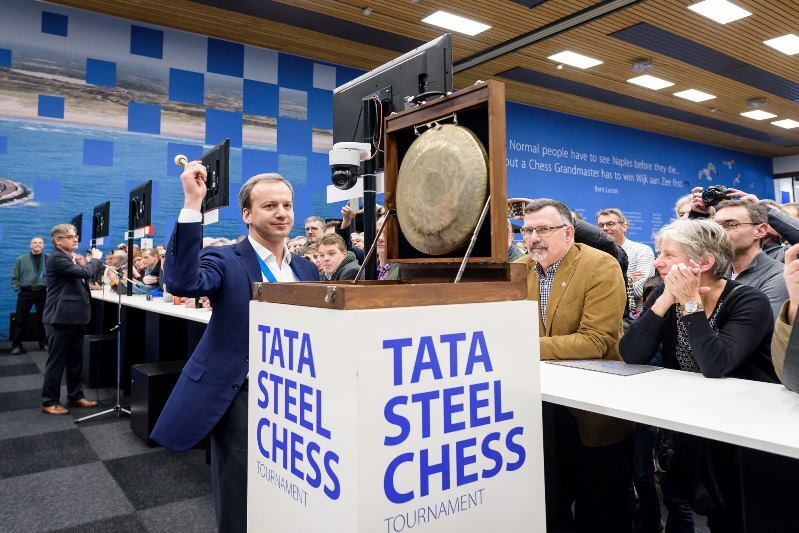 The final round of Tata Steel Chess begins 1.5 hours earlier than usual at noon, and needless to say you don’t want to miss Giri-Carlsen. If Anish can win the game he’d not only win the tournament but start February as an official member of the 2800 club. Tune in to live commentary with Jan Gustafsson and Peter Svidler from about 11:50 onwards!